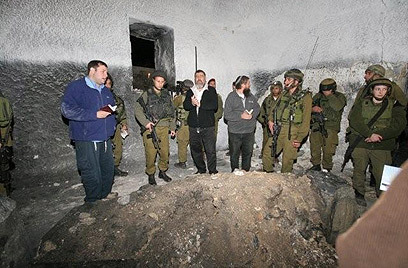 Hundreds of right-wing activists and settlers entered Joseph's Tomb in the West Bank city of Nablus on Wednesday night, accompanied by Israel Defense Forces soldiers. The visit followed a renovation of the site, considered the burial place of biblical patriarch Joseph, which had been desecrated by Palestinians over the past few years. "This is the most suitable.gif" style="display:nonet for the State of Israel and the people of Israel for Hanukkah, the holiday of Jewish braveness," said Gershon Mesika, head of the Shomron Regional Council. Joseph's Tomb was defiled by Palestinians after the IDF left the place in the year 2000. Over the years, the burial site was vandalized many times, until the gravestone was completely crashed. This year the Shomron Regional Council and the "Shchem Echad" association initiated visits to the gravesite, accompanied by IDF soldiers. The visitors were shocked by the condition of the gravestone, which had turned into a pile of stones. The entire site was burned and filled with heaps of trash. In light of the gravestone's severe condition, it was decided to try and renovate it. A group of Jewish professionals arrived at the site on Monday night, renovated the gravestone and cleaned the gravesite. A mass visit by right-wing activists and settlers to the gravesite was organized Wednesday night following the renovation. "I would like to thank the IDF's soldiers for this historic and important deed, which helped rebuild the gravestone, the gravestone of Joseph the pious. It's a disgrace that this holy tomb was desecrated barbarically for years by the Palestinian Authority," said Mesika, who was one of the visitors to arrive in Nablus. "Today's terrible reality at Joseph's Tomb – when even according to the Oslo Accords the site and the road leading to it were supposed to be controlled by the State of Israel, while in practice it is neglected and desecrated – is irrational. We call on the Israeli government to remove this shame and national disgrace, return to Joseph's Tomb and rebuild it," he added. "We feel pain over the situation at Joseph's Tomb in the past nine years," said Yehuda Liebman of the "Shchem Echad" association. "We view this act as the first step in repairing what is needed: Returning the situation to its previous condition and repairing it." Meanwhile, the Shomron Regional Council and the Samaria settlers' committee are preparing for the arrival of thousands of people at the evacuated northern West Bank settlement of Homesh on Sunday. A rally will be held in the area throughout the day and will be attended by rabbis, public figures and Knesset members, who will promise to help rebuild the settlements after the upcoming elections. See all talkbacks "Hundreds of settlers enter Joseph's Tomb "